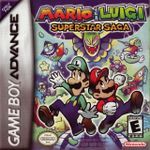 Mario & Luigi: Superstar Saga is an action RPG developed by Alphadream. It was published by Nintendo for the Gameboy Advance in 2003. The game is the first in the Mario & Luigi series and the first handheld version in the overall Mario RPG series after Super Mario RPG and Paper Mario. The game was well received and is still ranked among the top of the Gameboy Advance games by many. In the game the player controls the Mario Brothers on a quest in the Beanbean Kingdom to defeat the evil witch Cackletta in order to restore the voice of Princess Peach. The story develops throughout the game with many absurd twists. Absurd is a word that fits perfectly with M&L:SS as the game features many jokes, including comical references to previous Mario games and making fun of the Mario Bros Mario themselves. Especially Luigi is being mocked, for example by referring to him as "Mr. Green Mario Brother Guy". An important part of the game are the turn-based battles. Typically the Mario Brothers have to defeat a number of enemies at a time, or a boss. To do this, the player can select an attack to perform against the enemy of choice. Unlike more traditional RPG's the game features Timed Actions. With this the player can push buttons during an attack to increase the strength of the attack. The way to perform a correct Timed Action is different per type of attack. In the same manner Timed Actions can also be used to improve defense against an enemy attack. The game also features Bros moves that allow for attacking with both Mario and Luigi at the same time. Because of these possibilities the battle are more dynamic, challenging and interactive compared to traditional turn based battles. - Items can be bought found and sold. - The Mario Brothers experience levels go up, letting the player choose which skills they want to level up. - Solve environmental puzzles by cooperating between Mario and Luigi. - Many different Badges that aid the characters can be obtained and equipped to both Mario and Luigi. - The classic Mario Bros arcade game is present. There are two sequels to M&L:SS on Nintendo DS: 'Partners in Time' and 'Bowser's Inside Story'.